ViA Card - so much more than a new global card brand! As you will come to know ViA Card offer a very broad solution to everyone in the society. 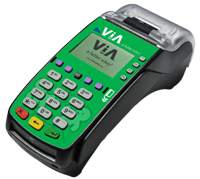 Besides the ViA Card as a card-product the ViA Model also has a POS Terminal Network (EDC terminals) or as we have come to defined as a Cluster of devices. The POS terminals has also got a new name, ViA eBM devices, describing that we do so much more than just handling a card transaction. 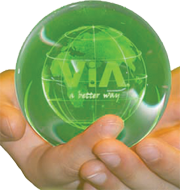 ViA Card is based on a Business Model Innovation (BMI) which already 2004/2004 started to inspire people around the world to think in new directions so that the traditional way of how to handel transactions and handling values could be made in a very disruptive manner, in such way that also the vast majority of consumers around the world, becomes part of the modern e-sosiety. ViA Card offers the merchant a completely new business model and more important, ViA Card brings new revenues in to the shop which results in that the space used for the ViA eBM terminal quickly becomes the most profitable space in the shop. Many people think that the word "disruptive" is a negative word, not at all. Disruptive thinking means that you do things in a new way - ViA a better way!
" I have't seen any books or schools who teach you how to become disruptive,"
says the innovator to the ViA Model and continue "There is only examples on what was disruptive, after it was made. ViA Card is built upon the Business Model Innovation and the Financial Model Innovation the groups founder finalized the base for back in 2005, at the time when ViA was conceived. The first Business Model Innovation which is built from inside of the unbanked consumers and merchants around the world. 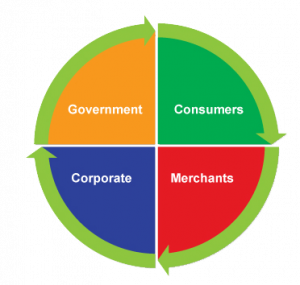 You will here find all the information you need for Consumers, Merchants, Corporations and Governments. POS & EDC terminals history, has during the evolotion of getting cards in the hand of bankable consumers around the world not changed so much. It all started with the simple card-inprinters and the nostalgic sales slip, where the data was partly inprinted by the embossed numbers and names on merchants fixed data and the embossed data from the cardholder. Which data was read by Optical readers. The format and the way the data is being handeled has not changed so much for the traditional card-brands. The new genaration ViA eBM devices is a multi FUNCTION and multi SERVICE device, which by the standrad configuration can handle up to 15 different main applications. Let say a bank has its own terminal software, which ViA can load into the eBM device, so that the eBM Device can accept both ViA Card and such Banks Cards.